This is the first of our four part series on how America entered the war. Before 1917 the United States was the capital G Great Neutral. The industrial and manpower base that the United States had access to could turn the war in anyone's favor, but to do that the country would probably have to enter the war. From 1914 to 1916 there was basically no chance that the United States would join into the war, but that would change in 1917. In this episode we are going to look at the events of the war before 1917 and how the United States reacted to them, before diving deep into the Zimmermann Telegram. We have bounced up against the United States several times during our episodes, like with our episode on the sinking of the Lusitania in 1915 and the discussion of unrestricted submarine warfare in the last few episodes so those topics will be touched on only briefly. Other topics will get a much more detailed explanation, and as an American citizen I will say that during my research for these episodes I learned quite a bit that, I would say, alters my perspective on the history. This is the first of our four part series on how America entered the war. Before 1917 the United States was the capital G Great Neutral. The industrial and manpower base that the United States had access to could turn the war in anyone's favor, but to do that the country would probably have to enter the war. From 1914 to 1916 there was basically no chance that the United States would join into the war, but that would change in 1917. In this episode we are going to look at the events of the war before 1917 and how the United States reacted to them, before diving deep into the Zimmermann Telegram. We have bounced up against the United States several times during our episodes, like with our episode on the sinking of the Lusitania in 1915 and the discussion of unrestricted submarine warfare in the last few episodes so those topics will be touched on only briefly. Other topics will get a much more detailed explanation, and as an American citizen I will say that during my research for these episodes I learned quite a bit that, I would say, alters my perspective on the history. Our intro and outro music for these episodes is the song Over There written by George Cohan in 1917, probably the most famous of America's wartime songs. Almost as soon as the war began the relationship of the belligerent countries and the United States began to change. On August 4, 1914 a British ship cut Germany's 5 underwater communication cables in the North Sea. This cut Germany off from the United States, at least in terms of direct communication. This was not hugely concerning when the war started, but would play a role in our story here in a bit. When the war started many people in America saw it as just another European War, they had been killing themselves for millenia. In fact many recent immigrants believed that they had escaped these kinds of conflicts and had no interest in joining another. On an official and nationstate level there would be some problems that would have to be addressed, regardless of whether or not the country got involved in the war. The first problem was the rights of neutral countries to use the oceans. The rights of neutral countries had been setup by the Declaration of London and an important piece of that declaration was that the belligerent countries had no right to seize neutral ship cargoes or food or other humanitarian goods. When the British did not agree to honor this treaty that they had signed, there was some concern in the US government. At the head of this concern was the Secretary of State, Robert Lansing. Lansing was a specialist in international law, and having another country so willfully ignoring these laws was, in his mind, completely unacceptable. Lansing would write a strong worded letter to be sent to the British, stating how unacceptable he believed, and by extension the United States government believed it was. However, when this letter reached President Wilson's desk, he refused to allow Lansing to send it. This was the moment, the moment when American could have brought the British into line. There were several courses of action that the United States could have taken to maintain neutral rights during the war. They could have told the British that they considered what they were doing an act of war. They could have refused to allow shipment of any American goods to the British. They could have been even more forceful by playing games with armed military vessels. They did none of them because they all carried some level of risk of a war with Britain and because many within the government were Anglophiles. Because of this lack of action they forfeited not just the neutral rights of the United States but also of every other neutral country in Europe and around the globe. Even the British recognized that at the end of the day they had to do what the Americans wanted, Foreign Minister Grey would say "This cardinal mistake would have been a breach with the United States, not necessarily a rupture, but a state of things which would have provoked American interference with the blockade, or led to an embargo on exports of munitions from the United States." I reiterate these facts because they are critical to understanding how Britain and Germany interacted with the United States over the next 4 years of war. The British could count on the support of the Anglophiles in the American government to maintain enough favor to keep the Americans on side. The Germans just wanted the United States to stand up for their rights that the Americans claimed were so important and that the Americans would get so angry about when the U-Boats came a calling. One of the authors that I used as a source for these episodes would say that it was almost like the Germans were playing the game with marked cards and a stacked deck. Publicly the United States would constantly, consistently, and loudly proclaim the rights of neutrals and freedom of the seas, but then they would turn around and do nothing about the largest violation of those rights, the British blockade. This would push Germany into more and more extreme measures, and would cause the British to have free reign over other neutrals who did not have the ability to stand up for themselves. The German desperation first manifested in the Unrestricted U-Boat campaign, which we talked about in an earlier episode. This then led to the Lusitania, a passenger liner, being sunk on its way to Britain, with Americans on board. While there was initially some public outrage, and official indignation from the United States government, the actual basis for outrage was a bit more flimsy. The issue was that the Lusitania was not a neutral ship, it was a British ship, and by travelling on it the Americans were knowingly putting themselves at risk. This did not prevent the American government from sending a note to the German ambassador saying, to the effect, that if there were any more attacks on American citizen the United States would consider it an act of war. The German government was by this point under no illusion that the American Government was some kind of impartial party in the war, it would be hard to miss that the Americans were siding with the British far too often. The German Ambassador Bernstorff even said as much to a representative of the government. A great example of why the Germans thought this came in the form of the financial situation between United States businesses and the British. In early 1915 the British and French had reached out to bankers on Wall Street to get loans for substantial amounts. This resulted in the issue of $500 million in bonds to be sold in the United States. While this bond issue was not very successful, for reasons we won't go into here, it was just a large example of the ties that were being created between the United States and the Entente. They were not necessarily official ties, but financial ties that would make it harder and harder for the government to do anything that would hurt the Entente, the inertia of the business ties was just too strong. On the home front the views on the war were mixed right from the start. At a high level the Republican opposition to the President tried to tap into this for their advantage. They chose to criticize the Democratic president as a coward and a pacifist, and in doing so they deeply misjudged public opinion. Most of the public wanted the country to stay out of the war, and the Republicans had painted themselves in favor of it, and Wilson on the side of peace. They also painted him as such a neutral figure that even when he would side with the Entente almost exclusively for the first three years of the war there was very little criticism. The U-Boat campaign would be something of a turning point in terms of public opinion. 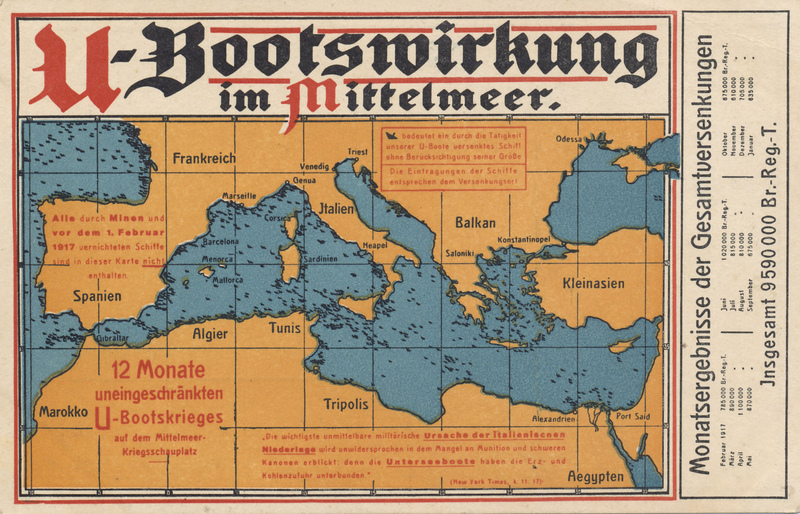 There was a small but grownign movement in 1915 that was pushing for some sort of intervention against the British blockade, however the U-Boats killed any support for that movement. Although I am not sure that it ever would have gotten large enough to sway the country completely. One issue when it came to trying to change the British, and rally public support to do so, was that the blockade was not exactly hurting the American economy. Whatever was lost in trade to Germany was more than made up for, and generally made up for many times over, in trade with the Entente. This removed any business support that would be necessary to push the government into real action. At the center of all of these actions, movements, and swings of public opinion was President Wilson. As I mentioned earlier he was seen as a bastion of American neutrality, and that is the image that persists through history, but the question is, how accurate is that image? A key piece of how Wilson saw his role in the conflict was explained by G.J. Myer in his book A World Remade "Wilson is famous as the great internationalist amongst American presidents. However, the world he wanted to create was one in which the exceptional position of America at the head of world civilization would be inscribed on the gravestone of European power. The peace of equals that Wilson had in mind would be a peace of collective European exhaustion. The brave new world would begin with the collective humbling of all the European powers at the feet of the United States, raised triumphant as the neutral arbiter and the source of a new form of international order" Wilson strongly believed that only he could arbitrate a peace that would be a lasting one, and that he would go down as an amazing statesman in the process. He would use various speeches throughout 1916 and 1917 to say this very thing, he would write about it privately, and he would discuss it with several friends. In 1916 he would write that "The aim of far-sighted statesmen should be to make of this mightiest of conflicts an object lesson for the future by bringing it to a close with the objects of each group of belligerents still unaccomplished and all the magnificent sacrifices on both sides gone for naught. Only then would the Europeans see the futility of using war as a means of attaining national ambitions. The world would be free to build its new peace structure on the solidest foundation it has ever possessed." These ideas would be the foundation of his Peace Without Victory idea, of creating a peace in which there were no true losers. Even if Wilson truly did want to hold the center in the conflict, he was sabotaged by his own government. When reading accounts of conversations and actions by Wilson's close advisors and senior political leaders in the government it is clear that there were only two kinds of people. Those that wanted to enter the war with the Entente and those that wanted to maintain neutrality. There were no strong voices that wanted to join the war against Britain and because of this the advice and decisions made by the government would always slightly lean towards favoring the British. This meant that while Wilson was making grand speeches and trying to get everybody to the table at a peace conference the Germans were starving to death and Wall Street was bankrolling the British war effort. So to answer my own question from just a moment ago, does Wilson live up to his historical image? I am inclined to say no. Wilson wanted to be a hero, he wanted to be a world leader, he probably would have been very happy as a United States President in the post World War 2 era where he could have been that leader. I do not particularly get the impression that he cared that much at all about neutrality or neutral rights, he cared about setting himself and the United States up as the peacemaker. When this fell apart in 1917 due to the pressures of unrestricted submarine warfare, he continued to try and keep America at the front and leading, in ways which we will discuss later. There are two events that are often pointed to as the reasons that the United States entered the war in 1917 the first of which was unrestricted U-Boat warfare, but since we covered that in some detail over the last three episodes we will not going into that gain. We will however go into the second of the events, the sending of the Zimmermann telegram. The Zimmermann telegram was a massive mistake and a huge blunder, so let's find out why. Before we get into the telegram itself, we should probably talk about the man that it is named after, Arthur Zimmermann. Zimmermann was the German Foreign Secretary in 1916 after a quick series of promotions through the German diplomatic services. He was seemingly well liked and known as somebody who worked very hard and was dedicated to doing his best. This positive view of Zimmermann was shared by both those inside the German civilian government, the military, and the American diplomats that he had to work with. It is somewhat unfortunately that his name will forever be associated with that would turn into his worst decision, a telegram that was sent to Mexico and Japan asking if they would like to enter the war. I do not think we have spent a single moment discussing Mexico on the podcast, so here is a very quick summary of the situation in Mexico in Early 1917. There had been a revolution in the country in 1911 which resulted in a military dictatorship. This dictatorship would then be replaced by a government led by Venustiano Carranza, who gained power with the help of the United States. The new Mexican government soon reached out to Berlin hoping that it would be able to help offset the growing influence of the United States. Then on March 9th, 1916 Pancho Villa launched a raid into New Mexico. Villa was a political rival of Carranza and hoped that by launching the raid it would trigger an American response. When that response came he then hoped that Carranza would be too weak to meet it, setting Carranza up for serious embarrassment. The raid was completely successful in this regard, and the United States launched a punitive expedition of 4,000 men under the command of John J. Pershing into Mexico. These two actions caused friction between the United States and Mexico to greatly increase, and it did not help the Germans that many claimed that Villa had been acting at the command of Berlin. The growing tension made the Carranza government extremely skittish when it came to its relations with its large northern neighbor, at the very least they did not want to do anything to make the situation worse. It was in this climate that the telegram from Zimmermann would arrive. We also have not spent too much time discussing Japan. Japan had joined the war on the Entente side right when the conflict started, but the fact that the war did not end quickly caused their devotion to the cause to waver. It seems clear to me that the Japanese had hoped for a quick war and some quick gains based on promises made by the British. In 1915 they began to angle for more concessions and they did this by having the government-controlled press take a decidedly anti-British tone. Some officials within the government began to advocate for an alliance with Germany, at least privately. While there would be discussions over the next 2 years between Japan and Germany and Japan and the Entente there was never any serious threat of the Japanese joining the war alongside Germany. They were just doing their best to leverage more rewards from the British. However, even after the German government was officially notified that the Japanese were not interested in any form of alliance some within the German government continued to hope that it would happen. An interesting fact, that I did not know, was that Mexico and Japan were quick close diplomatically that this dime due to their mutual distrust of the United States. With all of the background out of the way, we should move on to discussing what the actual telegram said. The decision was made inside the German foreign office to send a telegram to Japan and Mexico but it does not seem to have been considered a big decision. No minutes remain of the meeting in which it happen and when Zimmermann received the draft of the letter he left no comment on it and just signed off. The time it took to go from idea to the final text was quick short even those the German diplomatic corps was already a bit frantic in trying to deal with the impending official announcement of unrestricted submarine warfare. The message itself was short, and I will read it in full here. "We intend to begin unrestricted submarine warfare on the first of February. We shall endeavor in spite of this to keep the United States neutral. In the event of this not succeeding, we make Mexico a proposal of alliance on the following basis: Make war together, make peace together, generous financial support, and an understanding on our part that Mexico is to reconquer the lost territory in Texas, New Mexico and Arizona. The settlement in detail is left to you. You will inform the president [of Mexico] of the above most secretly as soon as the outbreak of war with the United States is certain and add the suggestion that he should, on his own initiative, invite Japan to immediate adherence and at the same time mediate between Japan and ourselves. Please call the [Mexican] president’s attention to the fact that the unrestricted employment of our submarines now offers the prospect of compelling England to make peace within a few months. Zimmermann." This message was sent on January 16th using an American cable from Europe. This is where the cutting of those German cables in 1914 comes back into our story. The Americans had kept their undersea cables open for the German to use to communicate with their officials in Washington in the hops that it would allow for peace discussions at some point in the future. 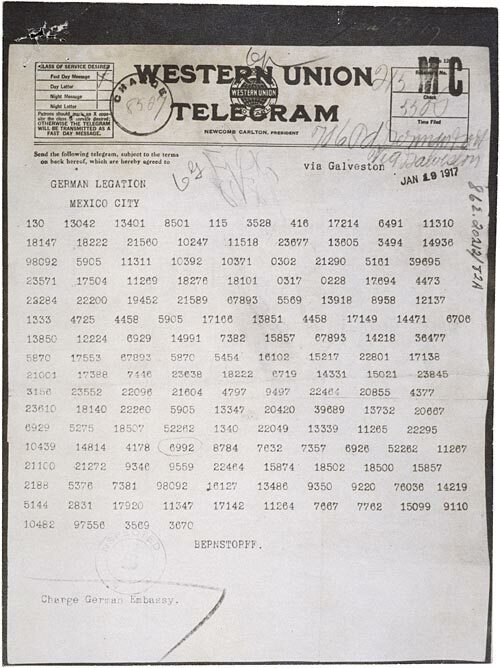 The fact that the Germans were not using it for the purposes of sending the Zimmermann Telegram would add a bit of irritation to the American government when it was discovered. In the telegram the Germans were promising to help Mexico retake Texas, New Mexico, and Arizona and all that Mexico had to do was join the war at which point the Germans would provide all necessary assistance. The note specifically said that Mexico should only join the war after the Americans had entered, in this way it was much like any other diplomatic conversation between countries, and the resulting alliances, that were constantly happening all over the world. When the message arrived in Washington Ambassador Bernstorff re-encrypted it and sent it on to Mexico city. Fun fact, he used Western Union to send the message that it would cost him the somewhat princely sum of $85.47. So the message had been sent, but it was encrypted, and the Americans could not break the encryption that was being used by the Germans at this point, so how did they find out what was in the message? Well that is where the British enter our story. The British had been able to break both the German and American diplomatic ciphers for pretty much the entire war. In fact in 1917 they had been reading every single message sent on the American trans-Atlantic cables for 2 years. However, at this specific moment the Germans had introduced a new cipher, called 0075, that while the British could read some of, they had not been able to fully crack. The most talented people that Room 40 had were soon put on the Zimmermann Telegram, here is Nigel de Gray the initial analyst "We could at once read enough groups for Knox to see that the telegram was important. Together he and I worked solidly all the morning upon it. With our crude methods and lack of staff no elaborate indexing of groups had been developed--only constantly recurring groups were noted in the working copies of the code as our fancy dictated. Work therefore was slow and laborious but by about mid-day we had got a skeleton version, sweating with excitement as we went on because neither of us doubted the importance of what we had in our hands" When a partially decrypted message was given to the head of Room 40 he would tell Grey that "This is a case where standing orders must be suspended. All copies of this message, both those in cypher and your own transcripts, are to be brought straight to me. Nothing is to be put on the files. This may be a very big thing, possibly the biggest thing of the war. For the present not a soul outisde this room is to be told anything at all." Intercepting a message, figuring out what was in it was all well and good, but there was one very sticky wicket. In Room 40 and the military informed the British Foreign office of the telegram they would be bound to share it with the Americans. At that point the British would have been in a tough spot. They would have had to tell he Americans were they got the message from, and that meant telling the Americans that they were reading everything on their cables, and that they had been for some time. This would have made the Americans none too happy, so some other method had to be found. The solution was found within the message itself. The British knew that the message was going to be forwarded to Mexico and they hoped that at that point it could be obtained by a British official in Mexico City. This was completed when the message was sent and the contents were forwarded to New York City and then to London. This message was also encrypted with an older cipher, which was the only one that the German embassy in Mexico had, and that let the British double check their copy of the original message and it gave them the ability to claim that they had never seen it before when they shortly handed it over to the Americans. Once the new copy of the message was decrypted it was given to the American Ambassador in London. Foreign Secretary Balfour made special note of the fact that it had been acquired by the British in Mexico. The American Ambassador then drafted a note to accompany the message and sent it to Washington. Along with this message was both an encrypted and decrypted copy of the message and enough information so that the Americans were able to get the exact message that was sent from Washington to Mexico City. This would then allow the Americans to be sure that the message was not a fake or altered by the British for their own advantage. When the note was presented to the Mexican and Japanese ambassadors they claimed that they had no previous knowledge of the contents of the telegram before it arrived. They tried to distance themselves from it as much as possible, and at this they were very successful. Just a few days later the Americans were convinced that the message posed no real security threat. When Wilson read the message he did not want it published immediately and was almost more angry at the fact that the Germans had sent it over the American cable than what the contents of the telegram actually were. The interventionists on the President's staff wanted the telegram published immediately to allow them to leverage it to move the country closer to war. None of them believed that the threat was Mexico and Japan was real, or that Germany could project any actual power to North America. 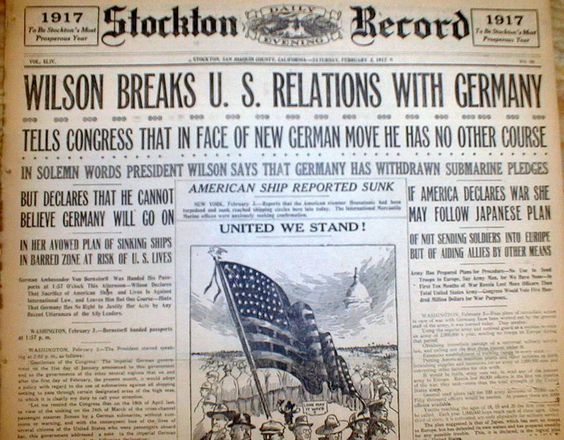 On March 1 the New York Times would lead with the headline "Germany Seeks Alliance Against U.S.: Asks Japan and Mexico to Join Her." This type of incident was exactly what many interventionists in the American Government had been hoping for, a reason to enter the war. In Congress the interventionists had a field day, while isolations did their best to turn the conversation back to neutrality. Overall the telegram would inflame the interventionists all over the country but it would not greatly sway the entire body of public opinion. There were still many questions by government officials and citizens about how wise it was for the country to get involved in Europe, where it had very little to gain. The interventionist though, who were the loudest voices in the room, just used it as an example of how the Germans were bad, and they had to be stopped, here they were promising American territory to the Mexicans! When Zimmermann was questioned by reports about his role in the telegram he denied nothing. This was initially seen as a blunder, however recent historians have believed that this was the best option available. By getting out in front of the message, Zimmermann gained the option of spinning the story in the best possible light. He did this by claiming that it was only a defensive measure, only to be activated in case the Americans declared war, it would never be enacted before the Americans did so. It did not really matter what Zimmermann said, and in the end his name, which would otherwise have been a completely forgettable on the grand scale of history, was attached to one of the most famous telegrams in American history. The question now was, would it lead America into the war, and if so, what role would it play in the decision, those are questions that we will dive into next episode.